Grand Designs Live at the NEC went from being a three-day to a four-day show this year and it was jam-packed for all four days. We were sharing an area with other people who work in the renewables and natural building sector such as straw-bale house builders, hemp block makers and lime-plaster renderers and we were all positioned in and around the skeleton of a timber-framed house. The whole section looked great. Once people had worked their way through the ‘plastic fantastic’ of sliding-door stands, jacuzzi salesmen and sun-lounger show offers, it was clearly a joy for them to be among real stuff like straw, wood and cast iron. The four of us were run off our feet answering questions, taking details and giving out brochures. We had a great mix of pellet stoves (Klover Smart 120 and Star 14), wood-burning boiler stoves (Woodfire RX 30 DS double-sided and a Woodfire CX 12), traditional dry wood stoves (Esse 100), upright contemporary stoves (Aarrow i400f and Morso 7443) and a super-cool wall-hung Wanders Black Pearl. 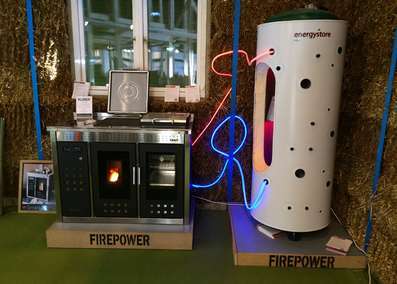 As always, there was huge interest in the pellet stoves and very little knowledge among the public about the Domestic RHI and just how generous those grants are. Once they understand how it works, they almost want to buy the stoves off the stand. One thing that did stand out was just how popular double-sided stoves are these days and, as a result, the Fondis brochures flew off the racks. The new double-sided Woodfire RX 30 DS also clearly hit the spot, as it combined the big upward trend in boiler stoves with that demand for double-sided stoves. We're going to be much too busy to do any more shows this side of Christmas, but we hope to see lots of our dealers at the next Grand Designs Live show at London ExCeL on 2-10 May 2015.